Hi, Friends! Today I’m joining some friends to share our Thanksgiving tables! 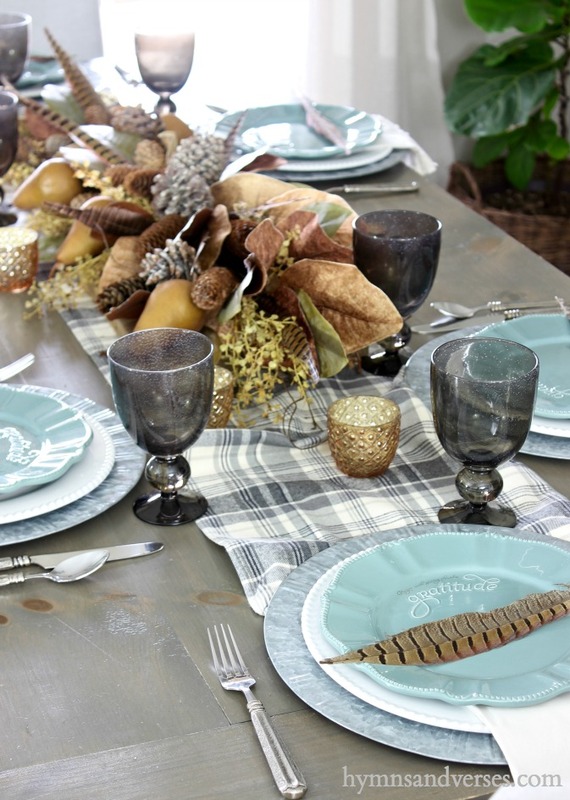 This fun Thanksgiving table tour is hosted by Tammy of Pink Peppermint Designs. My tablescape this year is not very fancy since I’m just hosting my immediate family and it will be pretty relaxed – which I prefer! Rolls may be tossed instead of passing a serving dish, but who cares!!! It will be a fun time with good food! *This post contains some affiliate links for your convenience. Please see my full disclosure statement HERE. If you are visiting here from 11 Magnolia Lane, welcome! Those girls know how to set a beautiful table! I just caught a sneak peak of their table setting yesterday and could not wait to visit their post today to see all of the details! For my table, I decided to go with a table runner this year instead of a full tablecloth. 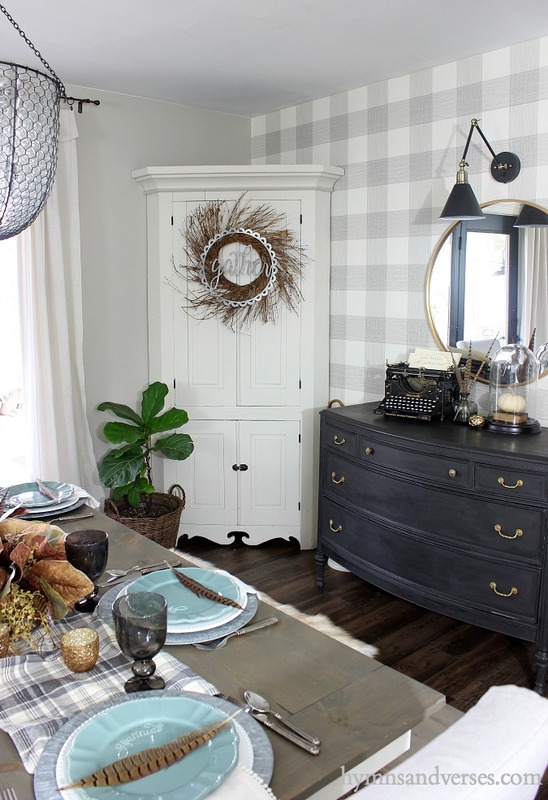 I found this pretty gray and cream plaid flannel runner at Pier One, and I gave it an informal feel by crumpling it up a bit instead of laying it out flat. My main centerpiece is a long breadboard topped with an arrangement of magnolia leaves, pinecones, some twigs, Bosc pears, and pheasant feathers. The main structure was formed with two large magnolia leaf and pinecone stems that I purchased at Hobby Lobby. I put them end to end on top of the breadboard and then added additional pinecones, pheasant feathers, and the Bosc pears. When it’s time to serve my meal, I can just lift the breadboard off the table to have room for all of the food! 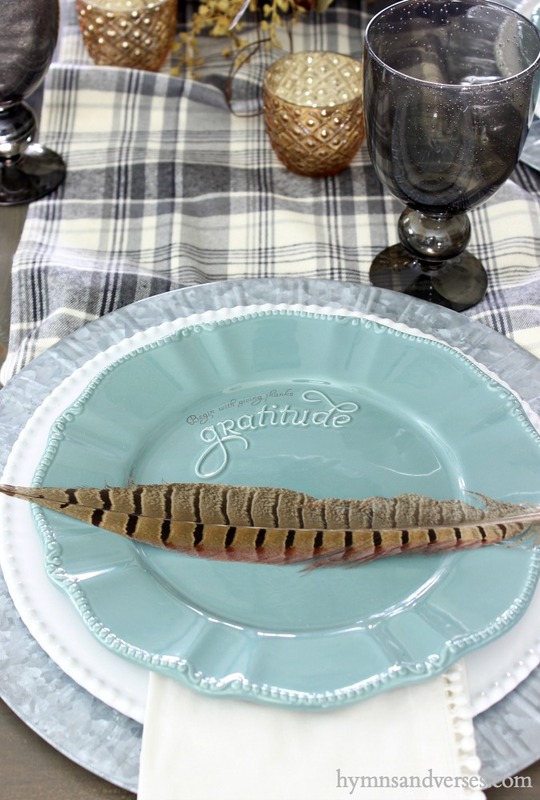 For each place setting, I used simple galvanized chargers with my white beaded dishes and these pretty teal salad plates that read: “Begin with giving thanks – Gratitude“. If you like these salad plates, you’ll want to come back here this coming Saturday for a giveaway! The pom pom edges of the off white napkins make them extra special! Those little details get me every time! These gray goblets from Target are so pretty. I love those tiny air bubbles in the blown glass! I used my favorite flatware from World Market. It works so well with the grays and galvanized chargers. On top of each plate I placed a pheasant feather. I’ll probably tie a name tag to each one on Thanksgiving day. Scattered this set of gold mercury glass votive holders around the table, because I always like to have some candlelight on my table! I was planning to use silver mercury glass, but when I got out all of my votives, I decided these gold ones worked really well with the colors of my centerpiece. Who says you can’t use galvanized tin and gold mercury glass on the same table? I did want to share the wreath that I put together on my corner cupboard. 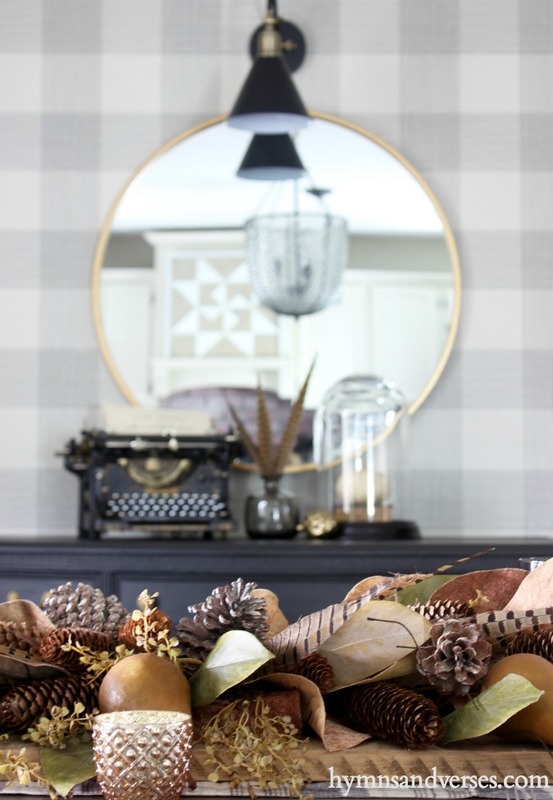 I saw the galvanized tin “gratitude” wreath at Hobby Lobby and immediately thought it would be perfect in my dining room since I was using the plates that also had the word “gratitude” on them! Then, I added this twig wreath from Hobby Lobby to use as a base for the galvanized piece. Thanks so much for stopping by today! Next, up on the Thanksgiving table tour is Carmel of Our Fifth House! I can’t wait to see her Thanksgiving table! If you missed yesterday’s tours, you can find the links below along with the entire line up! I love these tours so much because you can get so many ideas in one place!!! Your breadboard centerpiece is just gorgeous. I really love the gratitude plates. The soft aqua pairs beautifully with the gray. Hi, Doreen, Your table looks beautiful! I love everything about it. Think I’ll be heading out to Hobby Lobby today to see if I can find the magnolia/pine cone stems – love the centerpiece. Can you tell me where you purchased your galvanized chargers? I think they add a lot to the table. Thanks much and Happy Thanksgiving to you and yours! Hi, Barbara! Thanks so much!!! I got the chargers at HomeGoods this past summer, but I’m sure Hobby Lobby would have some galvanized chargers too! I also saw some really pretty ones at Pier1. Do you guys leave all those leaves and things on the table while you eat. It’s pretty. 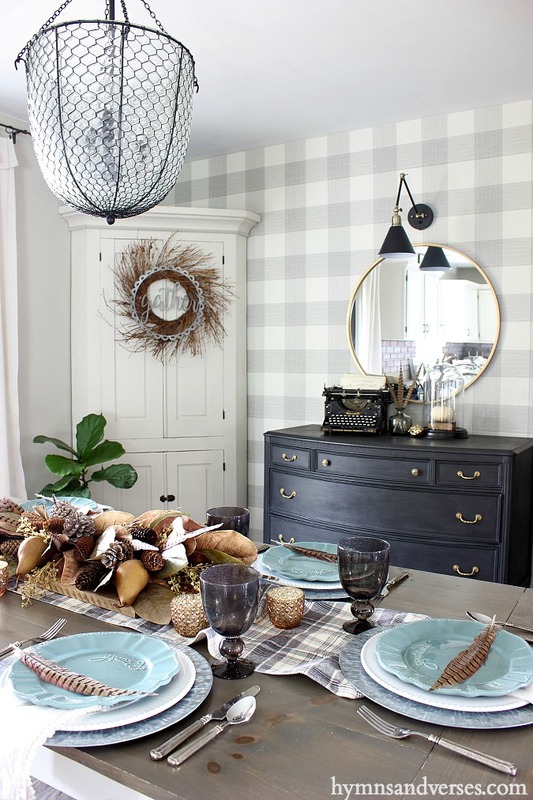 Love your pretty dining room and the soft aqua and brow of your table is so pretty too. I love the relaxed vibe going on with your blues and gray Doreen. Hope you will enjoy your thanksgiving. It just said – I’m grateful for . . . I enjoy getting together with family and friends and hearing all the ooohes and ahhhhs when it comes to the décor of the home and especially the table, I believe it makes the food taste better, lol. Your table is so calming and for sure will make your company feel welcome. Do you have any idea as to how to refresh magnolia leaves. My magnolia wreath is looking pretty sad. I love everything! I thought your gratitude blue plates were so perfect for your table. It’s a very inviting table.i noticed the wreath but would never have guessed that you’d “gussied up” one you’d found! I never think that way! What a statement piece this wreath is now! Another thing that looks great is the simplicity of your side table. It looks so good! I really like the wall, light, mirror and black. It looks very up to date! I’m also impressed with the table runner. I’d forgotten about your table. Is it a cement table top? Very lovely table–for some reason I’m not into pumpkins this year for decorating, so your centerpiece is perfect! It’s just lovely, Doreen, especially those sweet plates! I’ll have to come back for the giveaway. 🙂 So nice to get to tour with you–Happy Thanksgiving! Doreen, I just love your Thanksgiving Tablescape. The feather is such a great touch!